A space opera is what science fiction readers call an adventure in outer space and on alien planets. But a space opera could also be an opera, a musical work, that originated in outer space…. 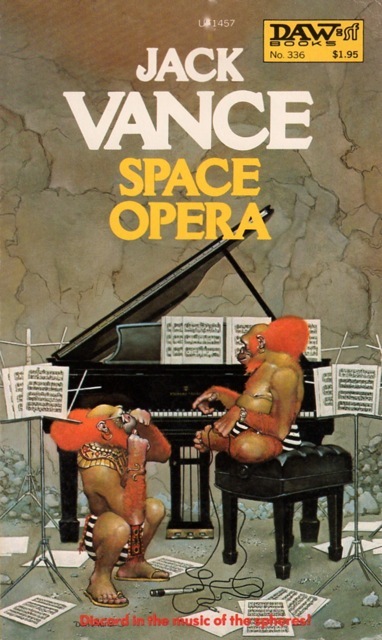 Jack Vance’s unique novel SPACE OPERA fits both definitions marvelously! Because it starts with the mysterious opera company from the equally mysterious planet Rlaru that arrives on Earth to astonish and infuriate music-lovers―and then disappears without a trace! And when Roger Wool’s wealthy aunt determined to reciprocate by bringing an Earthly operatic team into space and to the unknown world Rlaru, there unwinds a complex and surprising space opera of the first kind…filled with enigmatic aliens, weird worlds, and all the special color and cunning that is the hallmark of the best Jack Vance. This is my first time reading Jack Vance, and I have to say, I’m a bit embarrassed. Perhaps a little disappointed with myself. Why did it take me so long to discover this amazing author? I recognize that I can’t possibly read everything, but c’mon, this book was so great it makes me think I should buy one of those expensive complete sets that I think I saw a reference to. This book floored me with how enjoyable it was. And all my research indicates that if I’d met Jack Vance, we would have been pals. He just seems like such a wonderful fellow. It’s a damned shame that he passed away in 2013, although seeing as how he was 96 at the time, I don’t think I can begrudge him that. That’s a good run. I had to nab the cover from the Internet Speculative Fiction Database for this one, because the price sticker tore a gaping hole in mine before I got a chance to scan it. This is one of the pitfalls of buying used books from a non-specialty store, and I hope someday we can all find a way to prevent that kind of thing from happening. I hate so much that the cover of my copy is ruined, because it’s just great. It doesn’t have much of anything to do with the book. There are no apes with wristwatches in this novel. Still, it’s so good. Nice job, Don Maitz. The bulk of this book has to do with a woman named Dame Isabel Grayce, Secretary-Treasurer of the Opera League. While she’s not the main viewpoint character, she’s the one who causes most of the things that happen in this book to happen. Generally we follow the point of view of her nephew, Roger Wool. Roger is Dame Isabel’s layabout nephew, a guy with no real direction in his life beyond hopefully inheriting his aunt’s estate someday. He gets a job near the beginning of the book but is laid off within a few pages. He just doesn’t have a lot going for him. It was right around this point when I realized that I was basically reading a P.G. Wodehouse novel set in space. Even the dialogue was familiar. It delighted me. The novel starts with a concert. Some aliens from the planet Rlaru have arrived and there’s a lot of buzz about them sharing their native music. Some people think it’s a hoax. It’s widely believed that alien music would be unintelligible to humans since the cultural touchstones are going to be so wildly different. Rlaru is an unknown world to most people. Its discoverer, Adolph Gondar, is very hush-hush about the world and what he encountered there, but he did bring back their Ninth Company of musicians for this concert, so he’s famous because of that. The Ninth Company plays a bit of music and then mysteriously vanishes. Most people are perplexed by this; Dame Isabel is mad. She devises a grand scheme to introduce Earth music to the cosmos. Money isn’t an issue, although Roger is concerned that she’s going to piss away his future inheritance on the idea and tries to convince her to do otherwise. She will not relent. She hires a spaceship, captained by Gondar himself, and holds auditions for an opera company. She’s taking opera into space. Wacky adventures ensue. Roger, for his part, meets a lovely young lady named Madoc Roswyn. Roswyn is dead set on getting into space somehow and uses Roger to get her on board the ship. He asks her to marry him and then convinces Dame Isabel to take them along. She allows Roger to come, but not Roswyn. Roger sneaks her onto the ship, where she almost immediately leaves him, hooking up with both the captain and the astrogator. Roger is heartbroken. Lady Isabel’s itinerary takes them to various alien worlds on their way to Rlaru. Captain Gondar is the only person who knows where Rlaru is, and he won’t tell anybody the secret. This is a very light read that is almost entirely wacky vignettes. There’s not a lot of depth to the characters or the situations, and there isn’t overarching moral or point other than entertainment, which fits the theme well enough. This book isn’t trying to be anything more than that, and I can appreciate that. The first concert takes place on a planet around Sirius. The aliens there have four arms, four legs, and two heads. Dame Isabel decides that the opera company will put on Fidelio, and attempts to change the opera a bit for the aliens. For instance, these particular aliens don’t like open spaces and prefer caves, and since Fidelio features both plains and dungeons, she switches the two places around so that happy things happen in the dungeon and bad things happen on plains. She also attempts to have the singers dress in costume as the local aliens, and since color is very important for these aliens, there’s a lot of worry about how that plays out in the setpieces. Basically, they overprepare and things go badly. They flee the planet. On the next planet they encounter several variations on the local alien race. One group is described as “highly musical,” which intrigues Dame Isabel. Everyone is surprised when the performance plays for an audience of one. This guy says that he is the one who must listen to the music before allowing the general public to experience it. The company puts on three performances for the guy, who is consistently unimpressed. His review of the performances is stuffy, hypercritical, and full of untranslated alien words that nobody understands. He is also convinced that the conductor is one of the performers, and that his baton is his instrument. The alien calls it something like a “swish-stick” and is very critical of the conductor’s ability to perform with the instrument. He then charges the performers a fee for his services, which is to be paid in flashlight batteries. The other performance on this planet, for a different group of these aliens, is also riddled with cultural misunderstanding. The aliens think that the performance is supposed to be some kind of ordeal and are extremely unimpressed with it. They reciprocate with one of their own performances, which includes explosions and stuff like that. Once again, our performers flee the planet. The third planet is a human prison colony, where the warden is convinced that physiognomy is a chief cause of crime. The idea is that a person with, say, a suspicious chin will look at themselves in the mirror every day and see that and thus be convinced that they are a criminal and therefore do criminal things. The upshot of all this is that this prison world has one of the most advanced sources of plastic surgery available in the galaxy. A bunch of the criminals use this fact to attempt to transform themselves into members of the opera company, including Dame Isabel, but they are found out by Roger, whose role in the story has been otherwise minimal up to this point. Most of Roger’s story revolves around his infatuation with Madoc. I guess it’s more than an infatuation, considering that he actually got engaged to her, but she made it pretty clear early on that this was merely a means to an end. She hangs around with the captain and with the astrogator, who each, in turn, suggest that the ship change its plan and head for a certain planet. Finally, when it appears that this isn’t working, she explains why she’s been trying to convince the two of them to change course. It’s a weird bit. Madoc explains that she’s not just Welsh, she’s from space. Thousands of years ago, an advanced civilization rose on Earth and went to the stars. A group came back and settled in Wales, and all her life she’s been told about her mysterious heritage. She wants to go back and visit her homeworld. Roger takes her at her word and convinces his aunt to take the ship to this unknown planet. They arrive at the planet and find it deserted. Dame Isabel suggests that they put on a concert to see if anybody shows up. Some people do and attack the ship. Everybody flees. Finally Isabel convinces the captain to take them to Rlaru. He’s been suspiciously hesitant to do so for the entire book, but she refuses to pay him until they go there, so he relents. They go to Rlaru and the captain disappears from his cabin without a trace. The troupe puts on some shows to lackluster response. Dame Isabel, frustrated, tries to figure out why nobody in the galaxy has any proper sort of culture. Why can’t they just appreciate Mozart, as God intended? What’s wrong with the rest of the galaxy? It turns out that the Rlaru people are skipping the operas to go see the jug band put together by the crew of the ship. It also turns out, and this got weird, that the Rlaru have their own sort of artwork, which involves music and image and it all comes out of these weird balls they carry around. They use those to tell Roger how Captain Gondar came to the planet once and kidnapped the musicians that he brought back to Earth, and that’s why they hate him. Gondar confesses to this and everybody goes back home. There’s a short coda where we find out that Roger and Madoc got married and they’re happy. Okay, so I’m making it sound like this book doesn’t have a lot going for it. I get that. This was a very, very light read. It zipped by. I knocked out the whole 170 pages in a few hours, not counting a nap. There wasn’t a lot of depth to the book, but I thought that was okay. I didn’t come into this thinking that I was going to get some kind of grand treatise on music as the universal language and how aliens respond to it. In fact, I got quite the opposite. The book was almost a parody of the idea that music is universal. It goes to lengths to point out that there are certain elements of music that are baked into the system, so to speak, things like the rules of harmonics and why chords work and so forth. There was a little bit of musical theory exposition that I rather liked. But in the end, it was mostly just a story of a woman from Earth who wanted to bring “culture” to the galaxy and failed miserably, based mainly on the fact that the aliens they met were so alien that the music didn’t make any sense to them. I guess the book was trying to play on both of the meanings of the term “space opera,” and honestly I can’t say it succeeded all that well. The part that was supposed to be a pun was the fun part. I liked the musical bits. Everything else, including the story about Space Wales, felt a bit tacked on and didn’t really contribute to the story all that much. It felt like a side-story that didn’t mesh with the rest of the tale all that well. All-in-all, there didn’t seem to be much of a point. Still, I liked this book. It was so much fun to read. I can’t stress that enough. It had some flaws, yes, but in the end, I think it was a success. It definitely makes me want to read more Jack Vance, as much of him as I can find. In space, everyone is a critic. The good news is, there is a boatload of Vance out there for you to read now. This novel’s kinda jokey and not very representative of his works except for the style. Try the “Demon Princes” novels. “The Face” has the best ending of any book I know. I’ll be on the lookout for them. Thank you! Thank you for this review. You might enjoy Vance’s Alastor Cluster novels. The protagonist of Wyst: Alastor 1716 is a young painter who visits a planet where he gets caught up in a criminal/political conspiracy.